On our daily scroll through the health news here at StockdaleMartin we came across an interesting article about the “Baby Box” which showed how such a simple idea can significantly impact our lives. 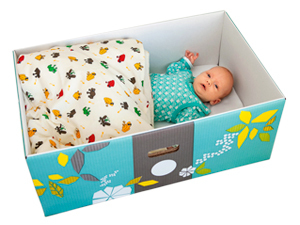 The Baby Box originates from Finland where each new mother receives a box stashed with supplies ready for their baby’s first days. The box includes a mattress and when placed at the bottom of the box creates the baby’s first bed and has been linked to lowering infant mortality rates. The simple but innovative idea is increasing in popularity with businesses being set up around the world and even the Duke and Duchess of Cambridge receiving a box from the Finnish Government for Prince George! The boxes have been tailored to suit the needs of individual countries and in some cases helping to tackle key health problems such as including a mosquito net in the South Asia box and South African mothers receiving plastic boxes to use as baths to help prevent infection. The Baby Box is being used around the world as part of life saving programmes. The story takes us back to the basics of product development and shows how such a clever product which is simply designed and has a real life impact can quickly become very successful.